Australian prime minister John Howard claimed 52 dead (including 7 Australians) in the London 7/7 bombings PsyOp, the very same night it happened, while they were still looking for the train-carriages on the ground and had not even started counting the alleged 'dead.' Scotland Yard did not announce the 52 figure in their story until 4 days later and said that the last carriage in which there were supposed to have been 26 dead was not even found until the third day. The first 30 minutes are quite annoying because Ab's previous guest, the interesting and very popular Australian you-tuber Jungle Surfer, stays on to meet Simon and insists on rambling on about how his veggie lifestyle makes him tough, blah, blah, blah. Luckily he has to leave to go make more videos, climb a tree for his mangoes or whatever it is he does, and a more rational, non-rambling, non-emotional discussion can finally begin amongst the two non-veggies on the show Simon Shack and Tim "Abirato." Many instances of alleged photographers who supposedly work for big agencies over the years who claimed to have photographed what is obvious faked imagery. Jim Fetzer makes the ridiculous claim that we have 9-11 images from all directions which all 'hang together,' (Hang together, how? Within the script of the movie?) and therefore, do not need to be questioned as to their authenticity at all. There are three main people in Fetzer's little final-layer-of-the-onion gatekeeping circus involved in creating a smokescreen' in front of Clues Forum: Don Fox, Ian Greenhalgh and Clare Kuehn. Fox and Greenhalgh go on the attack with all the ad hominems they can muster and Kuehn pretends to be the moderator, a voice of 'fairness' rather than just the other end of their attempt at controlled dialectic, saying some Clues Forum material is worthwhile, etc., but they go too far when they claim 'everything is fake,' something, of course, which Shack has never claimed. Simon Shack and crew do NOT claim that all the 9-11 footage is CGI, but that MEDIA FAKERY, in all its permutations and with all its myriad techniques of deception, of which CGI 3D animation is only one, is the main MODUS OPERANDI of the 9-11 False-Flag PsyOp (and many other PsyOps before and since). Because MOST or the VAST MAJORITY of the 9-11 footage and images they have examined are PROVEN to have been doctored, altered, tampered with, edited, composited, acted in and faked in one way or another, it follows that the ENTIRE batch is not only UNTRUSTWORTHY and not even worth your time to examine further into absurdity but any testimony in favor of the authenticity of such obvious fakery WOULD LONG AGO HAVE BEEN THROWN OUT OF ANY PROPER COURT OF LAW. The Fetzer gang's idea seems to be to get people to dismiss looking into the Clues research for themselves, to not use their own logic (the filter of reality) to discern things but to rely on these self-appointed bozos to pre-digest and filter things for them. Gatekeeper's prey on people's laziness and conditioned lack of trust in their own common sense. What's funny is that these three have effectively isolated themselves on Fetzer's own blog and most people contributing there are now supporting the Clues research! Of course, like all shills (direct agent or useful ego/idiot, result being the same), they simply deny, deny, deny and claim victory even as they suffer defeat after embarrassing defeat. "Simon Shack's King Kong Man debunked"
Greenhalgh's own blog is - most appropriately - called "The world according to me"! Flabbergasted wrote: Does it matter how tall the man is if, as Simon has already shown, the building in the NIST production is clearly different from the WTC? Ian Greenhalgh wrote: "Just look at the exterior column the man is next to, it is 56cm wide, for him to be 4m tall as Shack claims, he would have to be 8 times as tall as that column is wide, which plainly isn't the case." Greenhalgh does not (or more likely, pretends not to) understand that the whole point has to do with the relative architectural proportions (heights & widths) of the various elements (windows / spandrels) of the WTC tower façade - as shown in the "King Kong Man" video (animation) clip. Of course, IF the width of the exterior columns (56cm) were correctly proportioned with the window heights, King Kong Man would indeed be 8 times as tall as the columns are wide. In any event - to put it quite simply - no human being (that we know of) can be far taller than the WTC's 220cm (approx 7ft) window heights. Fetzer's modus operandi is playing on the archetype of the "open-minded professor" which allows people to surrender to authority and their own laziness and say "well, he's looking into it, so I don't have to. I'll just look into what he's looked into, trust in his "expertise" at logic and save myself time and effort." Fetzer seems to be (or pretends to be) obsessed and angry about the undebunked proofs of Shack on the tower-demoltion imagery, and his ONLY response is: "well, why would they fake it that way when it was actually done another way?" As if the ridiculously fake imagery of the planes themselves weren't 'easy-to-expose' enough, Fetzer now tries to say that despite all the proofs to the contrary (such as, for example, the obvious KING KONG man images posted above), the perps wouldn't make fake imagery of the tower collapses, simply because it 'exposes' them. He also jumps to the conclusion of automatically assuming that the real demolition imagery would have been satisfactory enough for what the perps wanted to accomplish: psychological manipulation of billions through trauma-induced fear-based conditioning and its endless repetition and reinforcement. They had to bring down the towers. They had to show something, so they just decided to show it in a spectacular way, in a Hollywood fashion. They didn't have many choices. How was the animator supposed to do this? The idea was that the plane made these fires in the upper floors, so the towers had to collapse top down. They obviously knew that it was a ridiculous idea but also knew that they had the power to just show this ridiculous thing a million times on TV and it would work, people would believe it, as they have and it has definitely worked. The entire big-picture of 9-11 does not hang together in so many ways it's ridiculous. 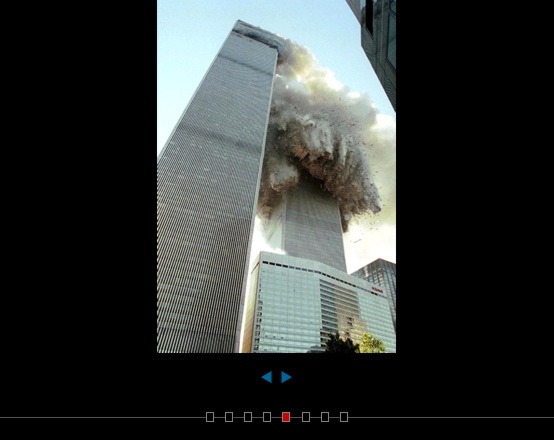 Clues Forum has looked at almost every single existing image of the 9-11 PsyOp and there are a thousand and one inconsistencies in the imagery. The images ALL have problems with each other in different ways. The pixels, the angles of falls, the situations we're supposed to imagine took place are all absurd. For example, if as Fetzer claims there was some kind of 'nuclear demolition,' then how did Newton Burkett survive reporting the demolition right under the towers? How did his supposed photographer Marty Glembotzky survive unharmed? And how did Mary Altaffer who supposedly took almost exactly the same picture, from the same angle as Marty Gelmbotsky, survive unharmed, with only seconds left to escape the complete demolition of the towers (as depicted on faked video, of course), especially if it was a "nuclear" demolition as Fetzer and his three-ring circus claim? In the last section, Shack and Abirato give the reasons why they think nuclear weapons are also most likely a hoax, one of the mega-hoaxes of the 20th century with many connections to the 9-11 hoax. The decision to do the "Manhattan Project" was made at the Bohemian Grove. Lyman Briggs changed the NIST bureau's culture from one of open access to one of secrecy. So NIST became a secret operation with the alibi that they needed 'secrecy' during the war. What kind of people came up with the idea for a bomb that could annihilate an entire city? 100,000 people supposedly worked for the Manhattan Project and all kept the secret. Not enough time to properly test such a bomb, much less perfect it. Not just the cartoonish bomb-test "mushroom cloud" images but even the Enola Gay plane images have very clear signs of tampering and fakery of the pre-digital era. The romantic and emotional writing styles of the PsyOpers of WWII and 9-11 haven't changed all that much. The main way that nuclear weapons tie to 9-11, of course, is the insistence of the Fetzer gang of shills that they have found strontium and barium and that nuclear bombs brought down the towers and this supposedly explains why the collapse images are the way they are (not because they are many-times-proven fake CGI cartoons, lol). Their entire reason for existing is to UPHOLD THE NUCLEAR BOMB INDUSTRY and the massive FEAR-MONGERING associated with the nuke hoax. Even more fear-mongering than that is this whole idea of MINI-NUKES or that "terrorists" can now have nukes in a briefcase. The 9-11 PsyOp had unlimited money and unlimited time to do the most perfect demolition ever. Overall 9 buildings were wiped off the map because of the 9-11 event, not 7 as some claim. There was also St. Nicholas Church also but Deutsche Bank was severely damaged and not fully brought down until 2008. Last edited by synergetic67; 09-03-2014 at 09:10 PM.